Just read Sun Yat-sen and study Singapore. Ostensibly, the Chinese economy is increasingly reliant on construction, which has stoked a huge credit boom. It is often said that China avoided a direct hit from the financial crisis of 2008, unlike the United States and Europe; essentially, Beijing built its way out of a recession. Certainly, the effects of this policy have filtered into China’s real estate sector. As academic Christopher Balding notes, a housing price index for 100 Chinese cities, published by Fang Holdings, rose 31 per cent to nearly US$202 per square foot from June 2015 to December 2017. “That's 38 per cent higher than the median price per square foot in the US, where per-capita income is more than 700 per cent higher than in China,” he said. While this is worrying, we contest the view that there is no real remedy to China’s current predicament. Actually, China is in a better situation than some countries in the West because it has the main ingredients needed to help mitigate the threat of a bursting housing bubble. Beijing need not look far for inspiration. 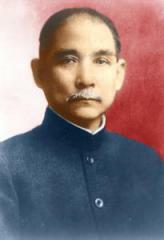 It could refer to the writings of Sun Yat-sen, the revolutionary leader who is still fondly remembered on the mainland. A man of letters and a philosopher on a range of topics, Sun took a particular interest in land tenure, probably after discovering American political economist Henry George as a young man in Hawaii. George argued for a single tax on land value, a principle now known as “Georgism”. Revolutionary leader Sun Yat-sen is still fondly remembered in Beijing. He took a particular interest in the idea of a single tax on land value. Why is a tax on land value an antidote to a housing bubble? Well, quite simply, taxing land at a high enough rate removes the incentive for speculators to generate the bubble in the first place. Taxing land and not capital (which seems the popular response to housing issues worldwide at the moment) is important for two reasons. First, land, unlike capital, cannot be hidden in tax havens or by fancy accounting. A land tax is both easier to administer and to pay. Second, a land tax recognises the ubiquitous importance of land to the economy and frees capital from economically harmful taxes. Taxing land promotes more efficient use because it becomes costly to leave land idle. Efficient land use is not only beneficial to economic growth and housing prices, but may also lower the costs of public infrastructure – it would help China avoid the kind of white elephant projects it has become increasingly known for. Despite the obvious merits of a land value tax, few countries have implemented it. Part of the problem is political: a government is likely to encounter a lot of resistance from landowners. In the democracies of the West, where it is firmly held that land can be completely owned by individuals, serious land reform is unlikely to be pushed for via the ballot box. This could be why a recent attempt to adopt some kind of Georgist reform came from unexpected quarters – Saudi Arabia, which started taxing empty lots. And this is where China has a clear advantage over most Western countries. Land in China remains state owned, and is leased out to individuals and groups. Therefore, China need not implement a land value tax per se, it just has to base its lease rates on the value of unimproved land. Beijing has yet to act, probably for political reasons (the housing boom may have enriched a lot of politically important people). But in 2017, President Xi Jinping made it clear that the question of the housing bubble was high on Beijing’s agenda when he remarked that houses are “for living in, not for speculation”. A targeted property tax is due to be introduced, probably at the end of 2019. To calm fears of a housing bubble, China could take a leaf out of Singapore’s book. According to a recent report on global real estate, Singapore is a rare city with a “fair-priced” housing market. We are still not sure what form and shape the Chinese property tax will take. But Beijing would do well to study the example of Singapore, which has, to a degree, realised Sun’s and George’s vision. Like in China, land tenure in Singapore is managed through a leasehold system. Unlike China, where land scarcity has never been a problem, Singapore is small and has had to embrace pragmatic policies ensuring efficient land use. Singapore’s land tenure system is also sufficiently road-tested. The Monetary Authority of Singapore cited the government’s anti-speculation measures in the property sector as an important reason why the country suffered relatively less than its neighbours during the Asian financial crisis. In Singapore, housing has become more affordable in the past decade, according to a recent report on global real estate; the island is a rare “fair-priced” housing market. In the face of potential economic issues, it would be shrewd for Beijing to reform its leasehold system. Not only would it help dissipate fears of a housing bubble, a policy that allows fairer access to land could also make China the envy of many a Western country.